Enhance the Security and Functionality of your Red Scarlet Camera with this Full Production Rig designed specifically for it. It’s rightly said; a support system specially designed while keeping the camera in mind can increase the functionality of that camera like no other. 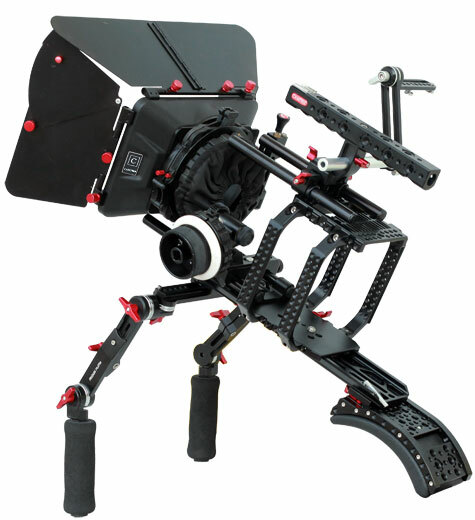 Our Camtree Hunt Camera cage Shoulder Rig Kit for Red Scarlet /Epic (CH-RSE-SRK) proves this very well. Not only it protects the camera from the rigors of production but also converts it into a full fledge production tool. This Robust rig enables easy & comfortable handheld operation and allows attaching various accessories for more possibilities on the professional front. This Performance package includes a high-grade matte box for cinematic effects, durable follow focus for accurate focus pulls & EVF mount for connecting View Finder or LCD. This high strength cage wraps around your camera while keeping it protected & lets you access all the ports, functions, buttons & doors on it. The Camera top plate features numerous threads for mounting various accessories and it also provides ventilation to camera. The high strength bottom plate ensures easy and secure camera mounting. HOLDING A CAGE WAS NEVER SO EASY! The Rock Solid Handle helps to carry the cage conveniently and also features threads for mounting various accessories. Carry the cage wherever you want!! The Fully functional cage allows getting smooth low angle shots without making you feel tired. No more shaky shots while shooting low angle shots!! This Red Scarlet cage is so full of mounting options that it expands into a production rig kit as per your shooting needs. Matches with numerous tripods quickly and delivers stable shots. The customized sturdy case, long-lasting and potent has been built from ultrahigh-impact copolymer with a strong wall design featuring an open cell core.